Rest your head in a place formerly occupied by a Sea Captain or Industrialist, in stone houses erected during the early stages of the American Revolution, in resorts founded in remote locales by risk-taking entrepreneurs. 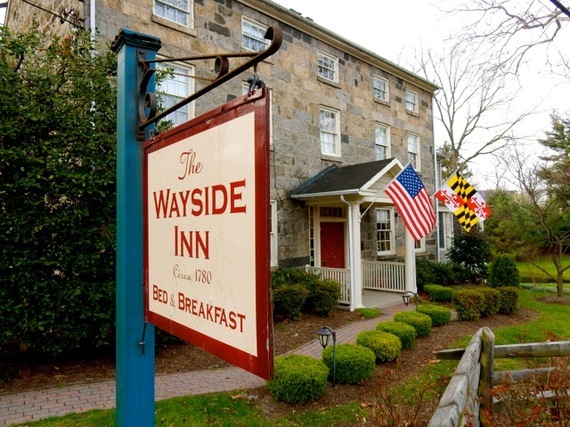 The following seven upscale establishments from Delaware to Maine - each with a unique origin story - allow you to stay overnight in the distant (and not so distant) past. For more information about what to do in each town, check out the GetawayMavens.com. 1. The Spruce Point Inn, Boothbay Harbor ME. 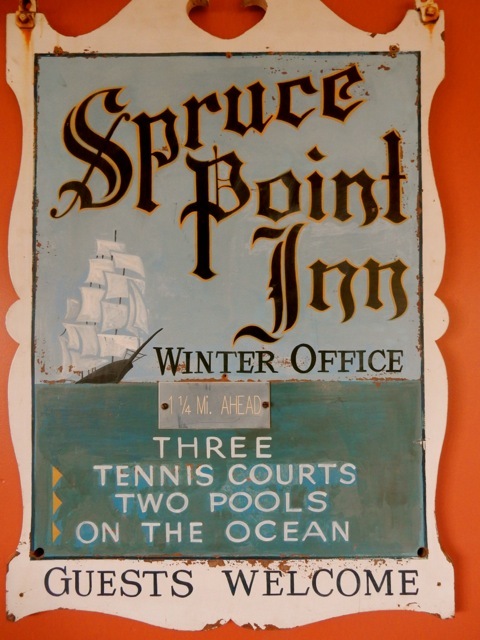 A favorite of the Kennedy Family and Ernest Hemmingway in the early 1900's, Spruce Point was perennially spruced up for down-staters in search of a certain kind of rustic comfort. Though rooms differ, most sport traditional Maine-Shore-from-another-era décor, updated for today's travelers. There are many nods to the past in the redone reception area lobby, a room with polished hardwood floor and bright open feel. Black and white photos of the Kennedy boys smiling on sailboats, and Hemmingway, relaxing with a drink in his hand in one of the chairs that still line the veranda, hang on the walls, along with old Spruce Point Inn signs. There is no question that this place held much allure for the glitterati of the 40's and 50's, and still holds special appeal to city-weary guests. 2. Captain A.V. Nickels Inn, Searsport ME. Tourists rushing to Bar Harbor on Route 1 have do doubt noticed this bright yellow Sea Captain's mansion, the Captain A.V. Nickels Inn (on the Historic Register), to the right while passing through Searsport - it stands out as the grandest structure in town. Innkeepers, Mike and Brenda Liston, who served in the U.S. Military (he, as Air Force Officer, she, as Director of Airmen and Family Readiness), found this magnificent home on the top of a hill while cruising up Route 1 in Mid Coast Maine. 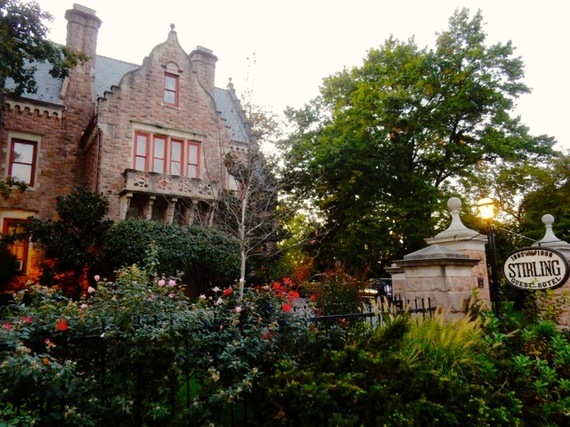 Purchasing it in 2011, the Liston's completely renovated it to gorgeous effect. Eight rooms are individually decorated and named for the Ports of Call that Captain Nickels frequented on his merchant ships. I stayed in the Port of Call Paris, boldly painted red and kited out with a carved four-poster canopy bed, white plantation shutters, polished wood floor with Oriental carpet, and Victorian art on the walls. The bed, I might add, was divine. 3. Stone House B&B, Hurley NY. 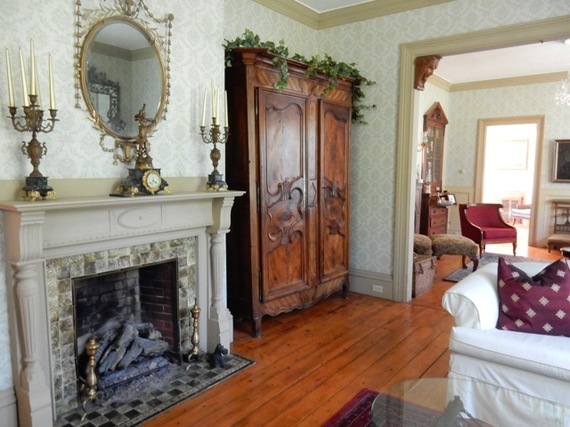 You've toured the famous stone houses in New Paltz nearby - now sleep in one - actually one of the oldest homes in New York State that you can stay in. Sam and Nadia Scoggins preside over The Stone House B&B, a fieldstone Dutch vernacular structure, dating from 1705, just outside of tiny Hurley NY. Each of five distinctive rooms contains a trove of antiques with updated beds as comfy, soft and cloudlike as a luxury inn's can get. Sam greets visitors at the back door with his winning British accent and warm countenance, and is proud to show off his well tended home. The communal parlor/living room, dressed in historic finery, trimmed in Federal Blue with polished wide plank floors, is warmed by a large fireplace in the colder months, and stocked with couches, seating and some of Sam's hand-crafted cheese boards and home-made items for sale. Poke around long enough and you'll see some pretty impressive architectural elements - e.g. the original iron hinges on the front door and Delft tiles on display (though Sam is quick to point out that those that grace the showers in some rooms are contemporary copies). Sam and Nadia serve a wonderful 3-course gourmet breakfast, made with fresh herbs and greens from the garden outside, in the large parlor beside the fireplace. 4. Ram's Head Inn, Shelter Island NY. 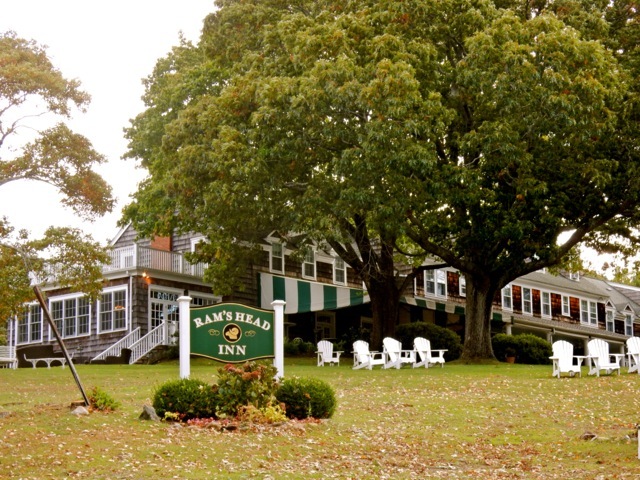 On a bulb of land separated from the rest of Shelter Island by a couple of narrow causeways, the hilltop Ram's Head Inn was originally built by Joan Covey as a resort in 1929. At the start of the Great Depression, Covey enticed her Real Estate clientele in Great Neck, Long Island, to enjoy an island getaway for low cost just a short drive from home. Though the inn has gone through several owners and permutations, it still honors Covey's original intent. In 1979, Linda and James Eklund purchased the property, fixed it up and have been renovating as needed year after year. If ever you yearn for a lost-in-time shore experience, this place delivers. A rambling, antique resort on an island (Big Ram Island) on an island (Shelter Island) on another island (Long Island), it takes a concerted effort to get to, but the property is so exquisite, you might not want to leave. It's easy, breezy, and with a stellar restaurant on the main floor, a self-contained resort. The lawn, peppered with white Adirondack chairs slopes down to a tiny cove beach from which you can kayak and swim in calm warm water. There's a gazebo, a bocce court, corn-hole boards and tennis courts as well: everything you'd need for a relaxing few days away from civilization. 5. 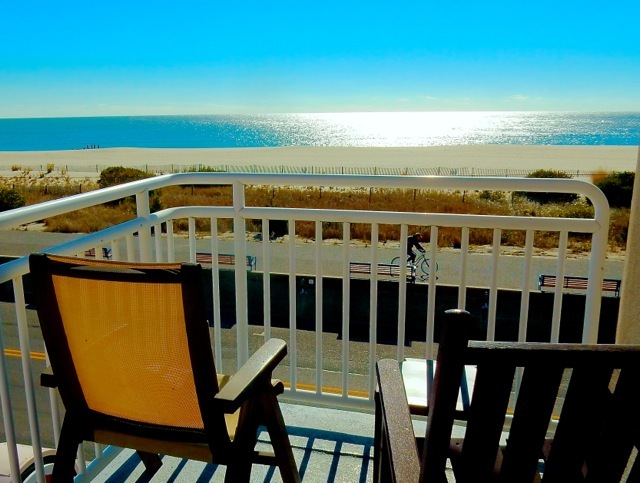 Montreal Beach Resort, Cape May NJ. Built in 1966, the building itself is not very "historic," but the back-story of the couple who established the Montreal Beach Resort is historically significant. Fifty years ago, holocaust survivor, Harry Hirsch, had the gumption and foresight to purchase this property in the sleepy residential town of Cape May, constructing a 27-room inn he named Montreal Beach Inn to attract an influx of Canadians then starting to make their way South to Florida. "This was the first warm beach they'd hit on the drive down," said Harry's sons, Larry and Joe Hirsch, who now run the upgraded 69-room property with Larry's son, Jonathan. Harry, nee Hersik, was born in Poland, and during WWII he and his twin brother, Joseph, were crammed into a boxcar and sent to Auschwitz at the age of 21. Eight months later, as the Russians advanced to liberate the camp, the Nazis forced prisoners to march in cold and snowy conditions, lining them up and murdering them, en masse, by firing squad. Somehow Hersik and Joseph survived: Hidden beneath a heap of dead bodies, they dug themselves out and eventually found safety in a Displaced Person's (DP) Camp. It was there that Hersik met and fell in love with his wife-to-be, Sofia Gross, who had taken part in the underground resistance. Hersik and Sofia moved to Philadelphia in 1951 - changing their names to Harry and Sophie Hirsch - before settling in Corbin City NJ as chicken farmers. Harry made contacts that would lead him to this empty residential lot east of town on Beach Avenue in Cape May. The Montreal Beach Resort has since become a family affair, with the third generation now involved. (Sophie passed away in 1974 of cancer at the age of 49, Harry in 2011 at 88). As a family run hotel, the Montreal Beach has welcomed multi-generations back time and time again. Some families have been returning at the same time each year for over 30 years and it's easy to see why. Located in the "quieter" part of Cape May, rooms are lovely, views of the Atlantic Ocean are terrific, and it's just a 10-minute walk along a paved oceanfront promenade to downtown. 6. Stirling Guest Hotel, Reading PA. The mansion on a hill in Reading PA, built in 1890 for iron industrialist and engineer, James Hervey Sternbergh (who designed and patented machinery to make nuts and bolts), was named for a castle in Scotland and is now one of the most regal places to stay in Reading PA. Sternbergh had eleven children, and one, his daughter Gertrude, lived in the family home for 97 years (1899 to 1996). 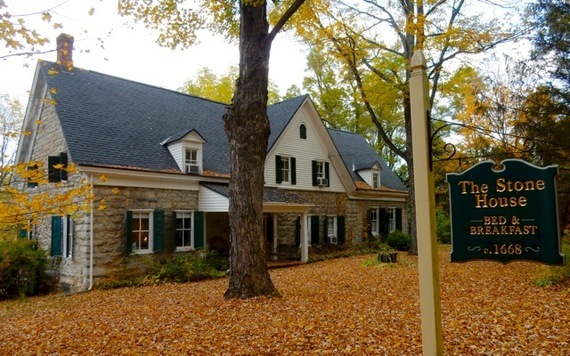 Gertrude would often open her home to the community, and so it remains - since 1998 as an upscale 15-room inn and a much sought after wedding venue. Enter into the soaring wood paneled lobby with its striking carved oak staircase. In many ways, Stirling retains its homey, though baronial, lived in vibe. All nine rooms in the main house and six in the Tudor-style carriage house are filled with original furnishings, many picked up by Gertrude on her world travels. Chinese lanterns that Gertrude purchased in the 1920's hang in the eye-catching porch, and sculpture-like sconces from her 1930's foray to Paris adorn the stairway walls. Room 10 (the Honeymoon Suite) is actually composed of two rooms - featuring a four-poster bed, a magnificent carved wood and tile fireplace, sitting room with gilded couch and chairs, and other grand appointments including a chest of drawers that must have belonged to Gertrude's father, as it came with a skeleton key labeled "papa's dresser."